A classroom assignment at Sam Houston State University has produced a scholarship for Montgomery County students who are majoring in education with an emphasis in reading/language arts. Bob Covington of General Aviation Services of Montgomery County has established The Project READ Scholarship in honor of Gena Sparks (left), a reading teacher at Lynn Lucas Middle School in Willis. "I have always felt that reading is important," said Sparks. "If a person can read, all things in life are possible. Reading is the foundation for everything in life." It was Sparks's class assignment in applied social psychology at Sam Houston State University that started the ball rolling. Sparks is a graduate of the University of Houston, but she was taking the class at Sam Houston State University last spring when she was inspired to actively become involved in promoting reading and literacy. 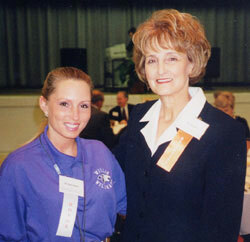 She chose SHSU to be the beneficiary of the scholarship because of the education program's strong reputation. The applied social psychology class, taught by Bernice Strauss, was assigned to develop a project using the exchange theory of learning ideas, which deals with rewards and costs in human social interaction. Sparks chose to research how to establish a scholarship, which would assist a Montgomery County student with education expenses. Sparks is on the board of trustees for The Friends of Willis Library which raises funds to support reading programs. "I initially ran into a few road blocks with my original idea, but shortly before the project was due, everything seemed to come together at once," she said. After meeting with Gary Bouse, the executive director of university advancement at SHSU, and learning how scholarships are established at Sam Houston State, Sparks began to research foundations and associations, and she applied for grants to fund a new scholarship. Covington heard about her project and volunteered to be the first investor in the scholarship. "What started out as a project, turned into a dream," said Sparks. The first recipient of the scholarship is Mary Nell Davis (right in photo) of Conroe, an SHSU senior who is studying to become an elementary school teacher with a reading specialization. A recipient of the scholarship must be a student in good standing enrolled at Sam Houston State University majoring in education with an emphasis in reading/language arts; demonstrate financial need; and live in or be from Montgomery County. The scholarship may be awarded to an incoming freshman, and grade point average is not a criterion for selection. Contributions to the scholarship fund can be made by contacting the Office of University Advancement, Sam Houston State University, P.O. Box 2537, Huntsville, TX 77341, Phone (936) 294-3625.